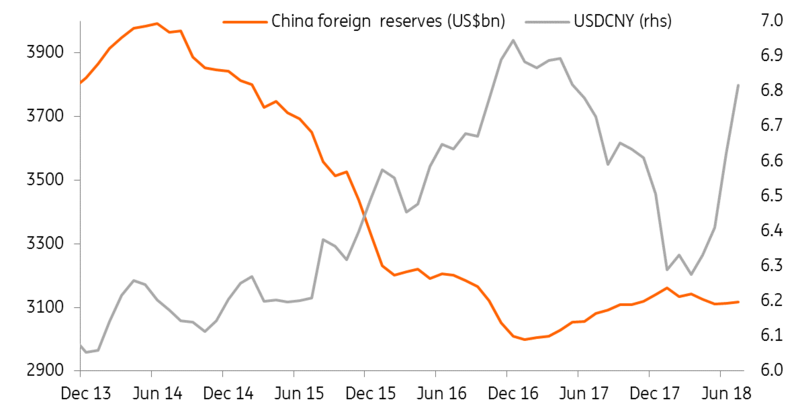 Even though the yuan has depreciated 2.96% in July, we don't see massive capital outflows as reflected by the foreign exchange reserves - which went up by $5.82 billion to $3117.95 billion from $3112.13 billion. The main reasons for the rise should be the trade surplus and an increase in foreign investments after China opened up more sectors for foreign investments. Another reason for the lack of capital outflows could be the recent list of penalties announcement by the cross-border regulator, SAFE, on entities that have breached cross-border fund flows regulations. This might prevent future rules violations, and therefore massive capital outflows. In fact, foreign direct investments by wholly owned foreign companies could remain the driver of an increase in the foreign exchange reserves for the rest of 2018. Wholly owned companies' investment increased to $10.97 billion in June from $6.30 billion in May, and the trend could continue in July because China has opened up more sectors to foreign investors since June. These sectors include shipbuilding, commercial plane building, shipping agents, etc. The Chinese government has cut the negative list from 63 clauses to 48 clauses. As the People's Bank of China (PBoC) has imposed a 20% reserves requirement on shorting yuan derivatives, this should reduce the possibility of having a large scale "short yuan" speculation. But this doesn't mean the yuan won't depreciate any more at all. In fact, it only implies that speculative activities are less likely to push yuan depreciation quickly. If the yuan depreciation speeds up again, like earlier this month (around 3% to 4% per day), then the PBoC is likely to reintroduce the "counter-cyclical factor" to cap the yuan depreciation level. By then a stable yuan would discourage massive capital outflows. It's worth noting that with the counter-cyclical factor in place, it doesn't mean the yuan will change course from depreciation to appreciation unless the dollar weakens against major currencies. Therefore, we keep the USD/CNY and USD/CNH forecast by year-end at 7.0.